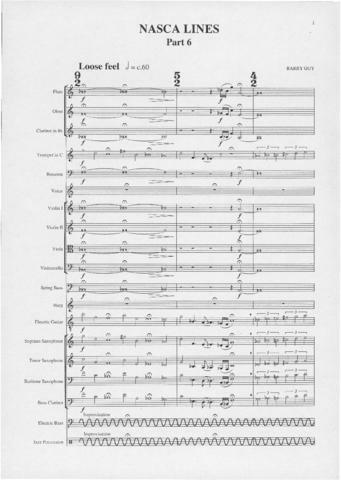 Item is a complete conductor's score for part 6 of Nasca Lines, in standard notation, featuring the saxophones, electric guitar, bass, and drums, with accompanying material provided by the remaining instruments. This section integrates moments of improvisation into the composed portions, frequently layering improvisation with composition (i.e. one or more instruments improvise, whilst others play that which is written). This section features pitch-class set sequences and a loose meter with frequent changes of time signature.